If talking about eBook reading on iPad, iPhone and iPod, we will associate to ePub, one of the most popular eBook formats that are widely used in eBook market. ePub is the default eBook format for Apple iBook and also friendly with other eBook reading devices, such as Sony reader, Kobo, Nook tablet, Surface, PSP and so on. Well, certainly that you can download or purchased your wanted ePub eBooks from web. But here, we will tell you another way to get ePub files: Create ePub files by yourself! Sounds tough? Actually it is quite a simple task as long as you have a right-hand assistant - Coolmuster ePub Converter (or ePub Converter for Mac). It can help you quickly build your own ePub eBooks from 5+ popular file formats, such as PDF (.pdf), Microsoft Word (.doc), Text (.txt), HTML (.htm, .html), MOBI (.mobi), etc., with the original text, images, graphics, tables, hyperlinks, layout, etc. perfectly preserved. Let’s go through the easy process to build ePub books. 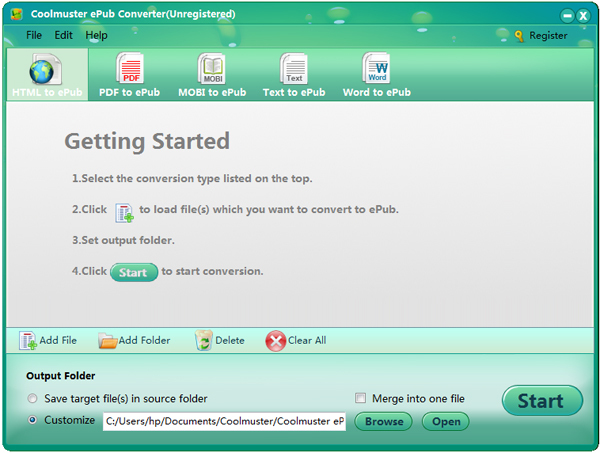 Free Download ePub Converter for Windows 7/8 and ePub Converter for Mac for Mac OS X from the link below. Please note the guide below is based on Windows platform. Operations on Mac computer are almost the same. Free download and install the ePub tool on your PC. Click the quick start icon on the desktop to launch it. Then, click and choose your needed conversion type and import the corresponding files to the program by clicking the “Add Files” button. Or you can directly drag and drop target files to save your time. If you want to combine multiple imported files into one single ePub file, you can check the option "Merge into One File". Here we are arriving at the last step. Just click the Start button located on the bottom right corner to start program. Also, you can right-click on specific imported file, choose "Convert Selected" and convert it to ePub format separately. The creation task will be done when the conversion progress shows 100%. Bingo! You can find the created ePub eBooks in the specified output folder. Now, you can transfer and read the ePub books created by yourself on any ePub friendly readers anytime and anywhere you like.